Right about now, all across the US, real estate supply and demand reports are being published, and many will be misjudged, misunderstood, and misreported. You can either allow yourself to be misguided, or you can choose to have a mind of your own. If you are thinking about selling a home, the best starting point for you when trying to determine the value of your home and the viability of a sale, is to study your local real estate supply and demand. Sure, most reports are national, but buyers are local and thus you need to find a report for your specific housing market. For the purpose of explaining why this is so critical, let's take a look at my local market, or more specifically, real estate supply and demand in Tallahassee, Florida. Good Samaritan Shout-Out: I want to say thanks to Jack for helping me yesterday when my car wouldn't start (just another reminder that Tallahassee is loaded with great neighbors!) I was at Sams Club and my car would not start. Jack was filling his car with gas next to me and noticed my dilemma, so he offered to help. Within 5 minutes, he had me on my way! Thank you Jack! 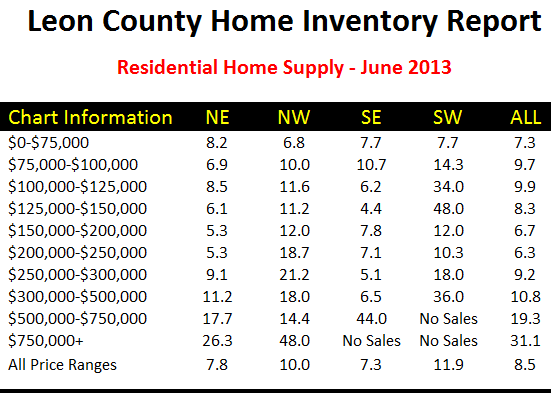 The following table shows the relative supply of homes for sale in Tallahassee. This is simply a measurement of how many homes that are listed for sale in the Tallahassee MLS, divided by the current rate of sales. The resulting number is the "months of supply," meaning if no new inventory hits the market over that period of time, we have all the homes necessary to fill current demand for that many months. Overall, Tallahassee has ten months supply of homes that are currently on the market in the Tallahassee MLS. This is the lowest level reported since June of 2008, and I could very easily write an article (as many of my peers from Coast to Coast will do) saying "REAL ESTATE SUPPLY IS FALLING!!!" While this would absolutely be true, it would hide the truth behind the numbers. If you are thinking about selling a home, you need to understand this truth. It is very likely that your market has similar numbers to what I am about to show you (in the Tallahassee real estate market), so make certain that you avoid just reading headlines when it comes to Tallahassee real estate supply and demand. 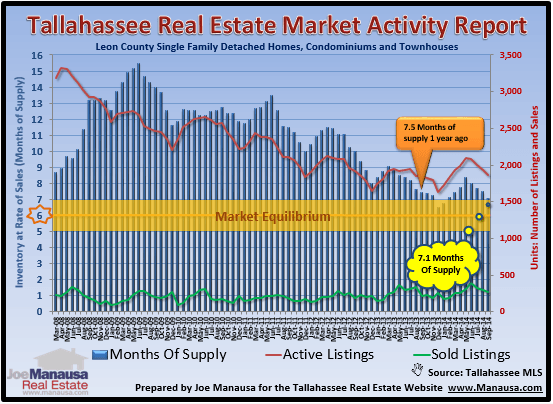 The real estate supply and demand graph above shows that the real supply of homes for sale in Tallahassee (red squares) is falling, as is the current rate of sales (green triangles), thus the resulting relative supply of homes for sale in Tallahassee (blue columns) is falling. So what is the "truth" that this graph is revealing? There are fewer homes on the market now than at any other time shown in the graph above, and this would be signs of improvement if not for the knowledge that sales continue to slide. That means there has to be something else going on with the supply side, because we know that homes are not being sold at a rate fast enough to warrant falling supply. To get a real understanding of real estate supply and demand in Tallahassee, I encourage you to read my in-depth analysis of the total supply of homes that need to be sold, including the large group of homes that are not (yet) listed for sale in the Tallahassee MLS. You can find the report on real estate market equilibrium here (<- Just click on the link and it will load in your browser). The aforementioned report will show you that while our real supply of homes for sale "on the market" is currently 1,833, the reality is that we have over 7,000 homes that have been identified in the recent past that "need to be sold." This shadow inventory of homes are reticent sellers who are not yet on the market because they know the demand is not there, and these will be streaming or rushing into the market over the weeks/months/years until they have been sold. We are talking about a back-log of supply that represents more than 3 years worth of supply, and remember, other people in the coming years will develop a need to sell their homes. There is no way the market can consume these homes in 2012 (or even 2013), so even a huge rush of buyers still puts the market several years away from gaining balance. This means that home values will continue to fall for the foreseeable future, regardless of what the half-truth housing reports will start spouting, due to "falling supply." When supply outraces demand in ANY market, the pressure on pricing rises and values fall. This also means that home sellers who sell now will get more money than sellers who wait until next year. If you are thinking about selling a home, drop me a note (<- Just click on the link and it a contact form will load in your browser) and let me know how I can help. If your home is in the Tallahassee area, we can schedule a time to meet. We can discuss the current value of your home and show you a very aggressive marketing plan designed to get you top dollar in this very difficult housing market. If you are outside of the Tallahassee area, I can guide you to the agent in your market area that I think best understands the real situation in your area, and has the best internet home marketing plan designed to get you sold fast, for the highest amount of money the market will bear. "Here we go again. Another year rolls around, and our "[r]eal estate industry professionals" are out there reeling off their predictions for the imminent return of the days when 20% yoy increases in house prices were "in the bag." Listen up, people: Those days are not coming back for at least a generation, perhaps two. The only reason why the NAR could come out with its report of a "dramatic" 17% gain in prices last quarter was because it substantially revised downward its totally bogus reports on sales over the past five years. So, of course, today's anemic numbers stick out dramatically when they are compared to the even more anemic figures that the NAR now admits were actually rung up beginning in 2007. For crying out loud, can't these "real estate industry professionals" see that their attempts fraudulently to "pump up" the market just aren't working? Why don't they try something different? Like what? Like, oh,... maybe telling the truth? They're just whistling past the proverbial graveyard when they insist that the return of the va-va-va-voom market of 2004-05 is just around the next corner. And if you believe them, then so are you!" Wow Karl, that kind of sums it all up, huh!